Here is a set of interesting references on long-term real estate prices in France, for the 1936-2015 period in the whole country and 1200-2015 for Paris. This vision in long-term series reminds me the long series on revenue on which Pikety supports his ideas. Series from 1200 in Paris are evidently based on various methodologies, with a lesser statistic representatively. They show an erratic journey, but reality can sometimes be so. There are three main ways to get data on real estate prices: conducting a study based on standard assumptions (usually comparing with neighbouring properties is factored), using listing prices or using the amount that the legal professional authorised by the Government to record the deed. This legal professional is a Civil Law Notary in civil law countries as Spain or France, or their former colonies. The third way is, assuming there is no tax cheat, the most precise, but it is not universally available, or its geographical detail is not of use; for instance, in Spain the General Notaries Council (www.notariado.org) publishes data by province. The geographical scope is relevant, as the real estate values depend a lot on location, and mixing in the same bag high price neighbourhoods with low price exurbs results in meaningless averages. In France notaries (www.immobilier.notaires.fr) do publish data with a detailed geographical scope (census blocks). This is good to understand recent activity. But a substantial part of the land has such a reduced amount of sales that data is not representative (or simply does not exist, just think of depressed rural areas with no sales for years). This does not prevent the fact that there is a demand for some kind of data, so it is estimated by a multifactor system, in which listing prices and realtors opinions are factored (www.meilleursagents.com). In the US the fact that there is a continental size nation with 50 legal systems has led to nationwide portals as www.trulia.com, which estimate prices for a substantial part of the country, even if a large part of the central states, as Texas or Louisiana, are not rendered. 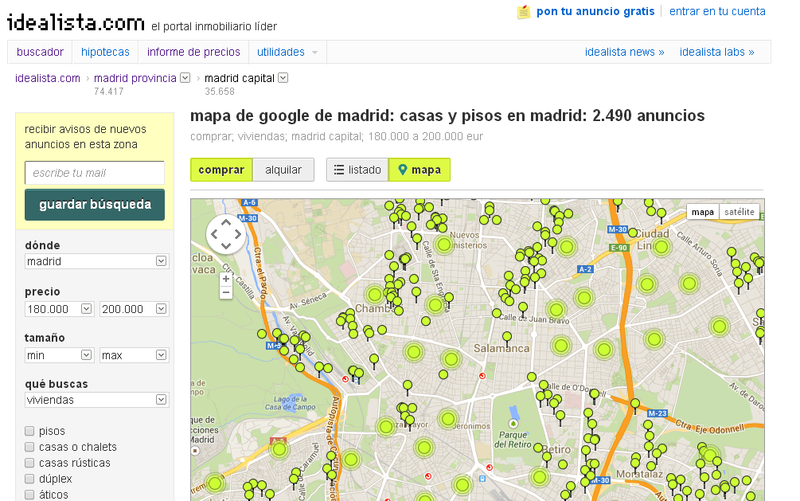 Taking as a reference data from www.meilleursagents.com, www.trulia.com and www.idealista.com for Paris, New York and Madrid, with an exchange rate of 0,72 € by $, and considering that 1 sq m is equal to 10,7 sq ft, you can see that the more expensive areas of Paris (rue du Bac, for instance) are over 14.200 €/sq m, those of Madrid (Recoletos) are around 11.000 €/sq m, and those of New York (Flatiron District) are in the region of the 16.000 €/sq m. Any need for more reasons to understand why the urban fabric of the core areas of successful cities has such an inertia?. Recent posts have been a vision on what you can buy with a given amount of money in different European cities, with a plan to show what you get for that money, are a reminder of how relative money’s value is. 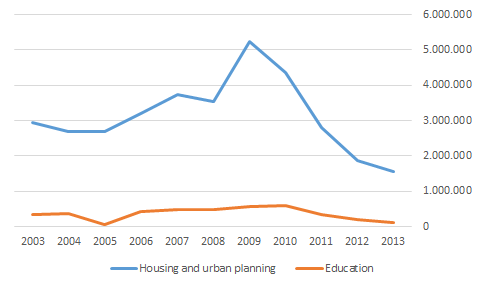 Using the same method for the 48 coterminous and Balearic Spanish provincial capitals, and using data about second-hand housing from idealista.com, you can see that the crisis context, which really has touched the whole country, has different impacts. Sure, average real estate prices for a sq m of housing have fallen in all the capitals, but there is a difference between Barcelona (-7%) or Madrid (-10%) and Guadalajara (-27,4%) or Tarragona (-22,2%). 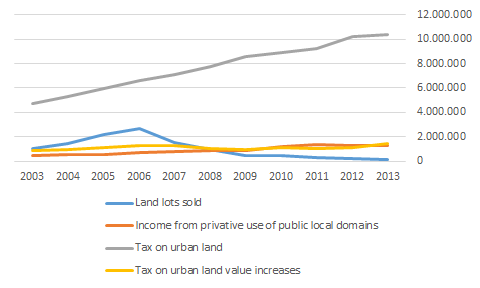 Despite these corrections, the hierarchical order of cities largely remains: San Sebastian is still the most expensive capital (high per capita revenue, small territory, attractive city), while areas with lower revenues or activity are usually in lower price ranges. According to January 2014 data from idealista.com, in Madrid and Barcelona 200.000 € would buy you about 60 sq m, while in Lleida you could get some 200 sq m, and in Caceres some 160. It is worth reminding that per capita revenue in Caceres is almost half that of Madrid. It is also worth reminding that these are average prices for the whole area of each municipality, hiding strong variations among neighbourhoods. And keep also in mind that prices reflect a balance between offer and demand, as real estate bubbles have shown so well. 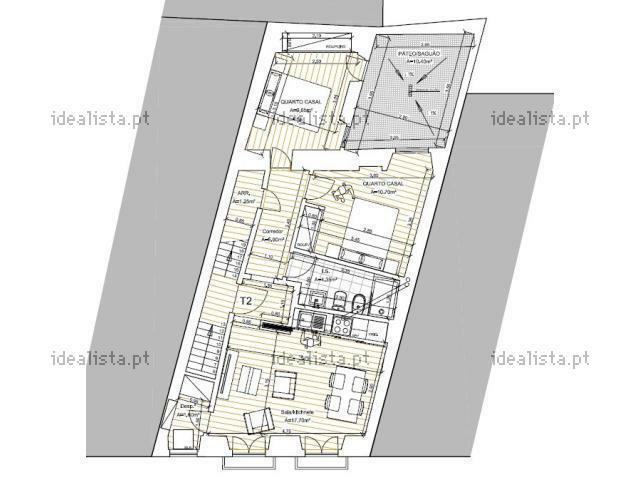 According to idealista.pt, the offer of homes under 200.000 € in Lisbon is rather large. According to the location and age of the building (few new buildings in this price range), you can reach up to 100 sq m for that price. In Paris city (not considering suburbs), according to logic-immo.com, 200.000 € would let you pay usually less than 15 sq m. In some cases you can even reach 25, even 30 sq m, in less central districts, but it seems uncommon. This is the cost of a very liked city, not just for tourism. According to funda.nl, the Dutch realtors association portal, there is a large offer of homes for sale in Amsterdam under 200.000 €. The Dutch market is not at its highest moment, with prices falling during 2013. In the most central areas the offer is made up of flats under the 50 sq m. Out of the inner ring surfaces are often over 80 or 90 sq m, a surface that is also reached north of the Ij river, already with individual homes. What is the euro for? Among other things, you can compare the cost of items across cities in Europe. As housing goes, 200.000 € can buy a home, but where and at which surface? In Madrid, according to idealista.com, there is a relevant offer at such price. In the most central areas there are homes of different areas, usually under 75 sq m; the construction year of the building and the conservation state are relevant. In peripheral areas you can reach larger surfaces, especially among the recently built housing stock still in the market. Renewable energy production systems installed in Europe during recent years mean that often areas that for most of the XXth century have just been energy consumers have become producers. 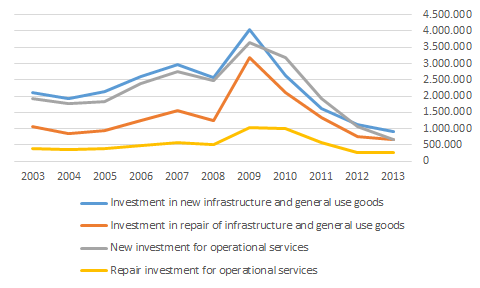 This has meant revenues, but also negative externalities of many kinds. As one more element in an increasingly growing trend all over Europe, the UK, up until now among the forefront states in terms of climate policy and mitigation, shows signs of a shift. And economic reasons are there, which requires at least a thought as in a democracy a government is elected to choose between opposed options. A recent report (November 2013) by Stephen Gibbons, from the London School of Economics, studied the impact of wind turbines on real estate values in neighbouring areas, with reductions averaging 11%. In June 2013 there were news about the study by the UK government of a compensation scheme for neighbouring communities. renewables-map.co.uk has published an interactive map showing the extent of the renewable energy systems across the UK, each with a potential impact; and the Highland Council map reveals the degree to which northern Scotland is receiving wind farms. On the other side, the opposition to wind farms in Europe is organizing initiatives as EPAW; its real capacity to push for alternatives depends on how they will reconcile potentially contradictory demands of their members. Those willing to defend the real estate value of their land, often to build more, can disagree with those opposing wind farms just for the sake of environmental and landscape conservation. But there may also be here a cultural issue. A 2009 report by the Massachusetts Clean Energy Center, based on US cases, showed just a minimal impact on real estate values. This would not mean Americans love their windmills, but rather that they have a different relative perception of their impact (and a different method in the reports).